Welcome to “Gettysburg Social!” This column examines the latest social media trends, while highlighting Gettysburg and Adams County businesses. This article was first published in Celebrate Gettysburg magazine, Sept/Oct 2013. Word clouds are a tech trend that’s “forecasted” to continue and grow in usage. And this is one type of cloud that definitely includes silver linings! Chances are you’ve seen a word cloud recently—on social media, in a presentation, in advertisements or as artwork. These clusters of words are usually grouped together in a theme, with a handful of words appearing especially prominent. Word clouds can also be called tag clouds or word art. 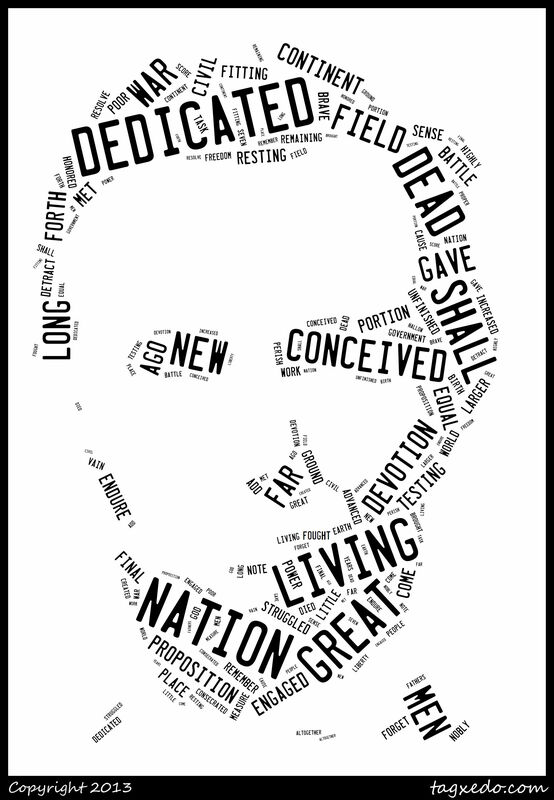 For a Gettysburg-themed word cloud, I entered the text of Lincoln’s Gettysburg Address into Tagxedo.com, which also let me select a likeness of Abraham Lincoln’s face as the shape. Go to one of several websites that generate word clouds: Tagxedo.com, Wordle.net, WordItOut.com, or the kid-friendly ABCya.com/word_clouds. Type in text of any kind: answers to a poll, text from a speech, a chapter from a literary work, or even a website URL. The website will generate a word cloud, pulling the most frequently-used words into a jumble. You can even customize the colors, font and shape of the word cloud. Save the word cloud into a jpeg or other file of your choice, or save the URL generated. Need a few ideas to get you started? Use a word cloud in the opening slide for your next presentation or PowerPoint to emphasize your main points, create a customized word cloud for your website or blog header, or see what words are trending within an industry or within current events (enter cnn.com into tagxedo, for example). Teachers could create word clouds based upon students’ answers to a question to see the most popular responses. Or you can create word clouds as works of art based upon your favorite poems or literary works, and frame them. The sky’s the limit! This entry was posted in Visual Storytelling and tagged Abraham Lincoln word cloud, Celebrate Gettysburg, Gettysburg Address in word art, Gettysburg Social, how to create word clouds, how to use word clouds, Karen Hendricks, tag clouds, word art by Karen Hendricks. Bookmark the permalink.